Don't let thieves steal your cargo or tailgate. 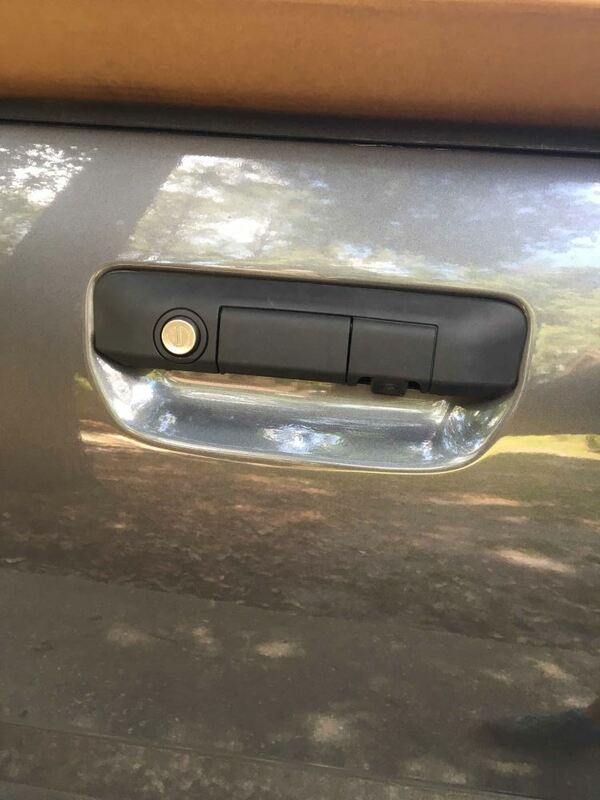 Add security for your valuables with this ABS plastic tailgate handle that has a keyed, steel tailgate lock. Perfect for use with tonneau covers and camper shells. Replaces your OEM handle. Lowest Prices for the best vehicle locks from Pop and Lock. 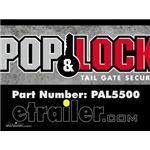 Pop & Lock Custom Locking Tailgate Handle - Manual - Black part number PAL5500 can be ordered online at etrailer.com or call 800-298-8924 for expert service. Don't let thieves steal your cargo or tailgate. Add security for your valuables with this ABS plastic tailgate handle that has a keyed, steel tailgate lock. Perfect for use with tonneau covers and camper shells. Replaces your OEM handle. Replace your existing factory tailgate handle with this ABS black plastic tailgate handle that has a built-in lock. Use the Pop & Lock with your truck-bed cover or camper shell whenever you need to lock up valuables in your truck bed. The Pop & Lock locking mechanism is made of sturdy, armored steel to resist tampering. The lock is raised slightly for convenient key access and to help prevent pinching. And the handle installs easily using basic tools - no welding or drilling is necessary. The custom design gives you a straight-from-the-factory look, and the black color complements any other black trim on your truck. A new tailgate can cost you hundreds - the Pop & Lock saves you the cost and aggravation of replacing a stolen tailgate. Rola Spring Loaded Trunk Organizer, Large 38"x15"x7"
Today we're going to review part number PAL5500. This is the Pop and Lock manual custom locking tailgate handle. It's black in color. This is a custom fit part. 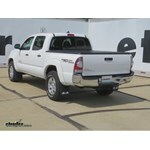 It is designed to fit the Toyota Tacoma vehicle, starting in 2005. On a custom fit part, I always recommend to go to our website, use our fit guide, put in your year and model vehicle and it will show you if this will work for your application. This is a keyed lock in tailgate handle which will discourage theft of your cargo and even of your tailgate. It will create secure storage for your valuables when it's used with a inaudible 00:00:34 cover or a truck bed cab. It has a tough armor steel lock which will resist tampering. Again, it is customized for your vehicle, the ABS plastic locking handle replaces your OEM tailgate handle and it will work on trucks with or without a backup camera. The black color will compliment any other black trim on your truck. It has a nice, raised lock for quick key access, so your key can just go right in there. It does include everything shown here, it includes the lock handle assembly, the two keys, a nice set of detailed instructions. It's a very simple installation, there's no drilling or welding necessary. It requires only basic tools to install it. That should do it for the review on part number PAL5500, the Pop and Lock manual custom locking tailgate handle, black in color. Order: RelevanceNewestRating - High to LowRating - Low to High Don't let thieves steal your cargo or tailgate. Add security for your valuables with this ABS plastic tailgate handle that has a keyed, steel tailgate lock. Perfect for use with tonneau covers and camper shells. Replaces your OEM handle. Thanks for your review Nick, but our part number is PAL5500, and that translates to the Pop and Lock part number PL5500. It has held up well and works great. I still recommend it! Its still working great after a year. Good product. 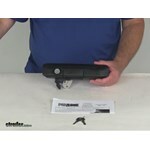 For your 2010 Toyota Tacoma Quad Cab, I would recommend using the Pop and Lock Custom Locking Tailgate Handle, # PAL5500. This tailgate lock includes a slot for the backup camera and is designed to give a factory look. Yes. I checked with Pop and Lock and manual tailgate lock # PAL5500 is a fit for your 2015 Toyota Tacoma Doublecab Prerunner. If you wanted to make it a power lock you could use the conversion kit # PAL8525. I confirmed with Pop and Lock that the Pop and Lock Custom Locking Tailgate Handle # PAL5500 is the replacement handle you need for your 2011 Toyota Tacoma. Yes, the Pop and Lock Tailgate Lock part # PAL5500 that you referenced has been confirmed to fit your 2015 Toyota Tacoma and will work on models of your truck with or without a backup camera. I spoke with my contact at Pop and Lock and he told me the # PAL5500 will work for you. Here is what he emailed me: The reason the cylinder is on the opposite side is because this was our older model # PAL5300. Yes the # PAL5500 will fit this vehicle. Pop and Lock does have the manual locking tailgate handle, # PAL5500, that will work with your 2015 Toyota Tacoma with backup camera. You can turn it into a power locking handle by adding conversion kit # PAL8525. Both of the Pop & Lock manual tailgate locks that you referenced, # PAL5500 and # PAL5400, are confirmed to fit your 2014 Toyota Tacoma's OEM tailgate. The difference between them is that part # PAL5400 is equipped with a lock cylinder that can be coded to match your ignition key, thanks to it including the patented BOLT coding technology. The Pop & Lock Custom Tailgate Lock # PAL8521 will convert the factory tailgate handle to a locking tailgate, whereas the Pop & Lock Custom Tailgate Lock # PAL8525 converts a non-powered locking tailgate by Pop and Lock like part # PAL5400 or # PAL5500 so that it can be powered by the power locks of the vehicle. You would want the # PAL8521 since it sounds like you don't have a # PAL5500 or # PAL5400 installed on your truck. Yes the Pop and Lock Custom Locking Tailgate Handle # PAL5500 that you referenced has been confirmed to fit your 2015 Toyota Tacoma. The Pop and Lock # PAL5500 locking tailgate handle you referenced is compatible with the OEM back up camera. 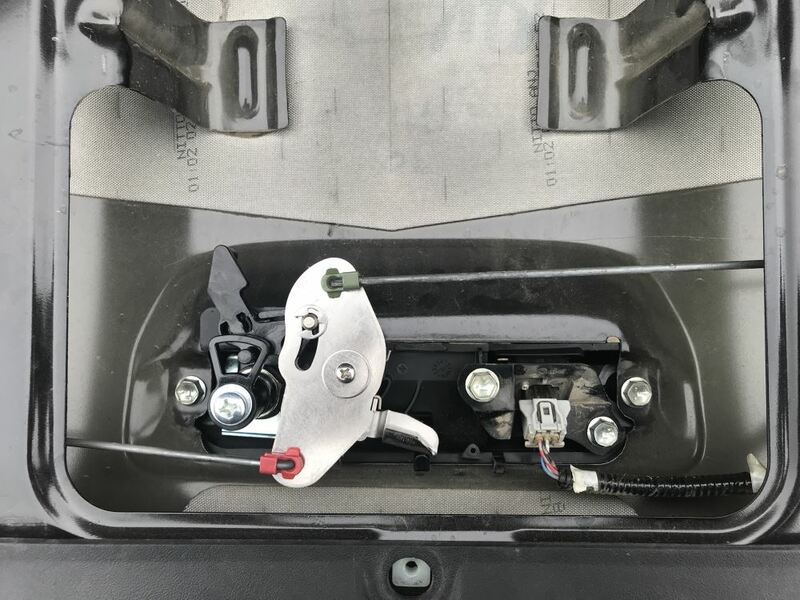 The camera would install in the slot in the back of the tailgate handle housing, and the small knock-out on the underside of the housing would need to be removed. I have edited a photo for you that shows where the camera would mount. 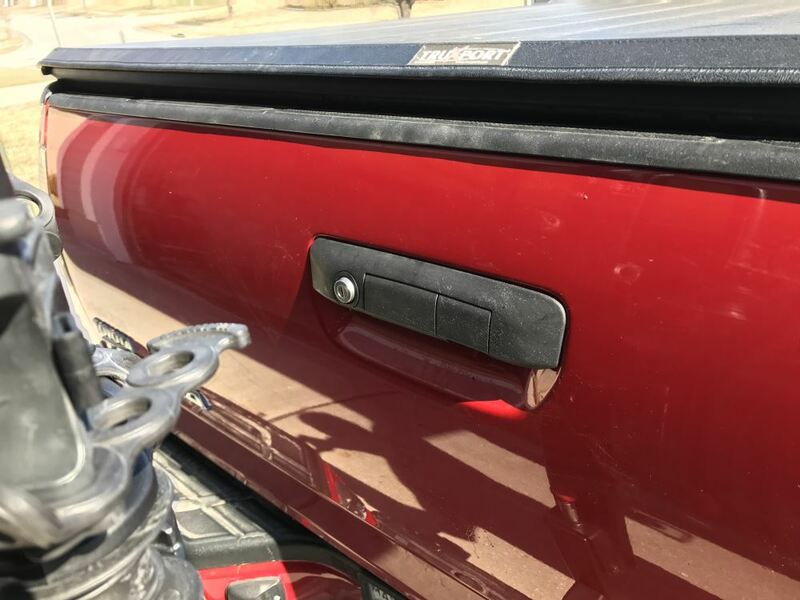 The Pop & Lock Custom Tailgate Handle with Lock # PAL5400 that you referenced is confirmed as a fit for all models of the 2005 Toyota Tacoma so it would work well for you. This one will key to your truck door key so that the same key will open the tailgate. The part numbers # PAL5500 listed as a fit for your truck as well. These use their own keys. There are powered tailgate locks available for your 2013 Toyota Tacoma. We have # PAL85403 for white and # PAL8550 for black. In order for the power tailgate locks to work the truck has to have power door locks. If it doesn't then you would need to add switch kit # PAL9520. According to Pop and Lock, the back-up camera in your 2010 Tacoma is indeed compatible with the # PAL5500 locking tailgate handle. There will be enough slack in the wiring to move the camera from its existing location on the OE tailgate handle to the left side of the Pop and Lock # PAL5500. Yes, the backup camera on your 2011 Toyota Tacoma will be moved to the new tailgate lock if you choose to install the Pop and Lock Custom Tailgate Lock, # PAL5500. This lock has a slot specifically designed to house the camera. 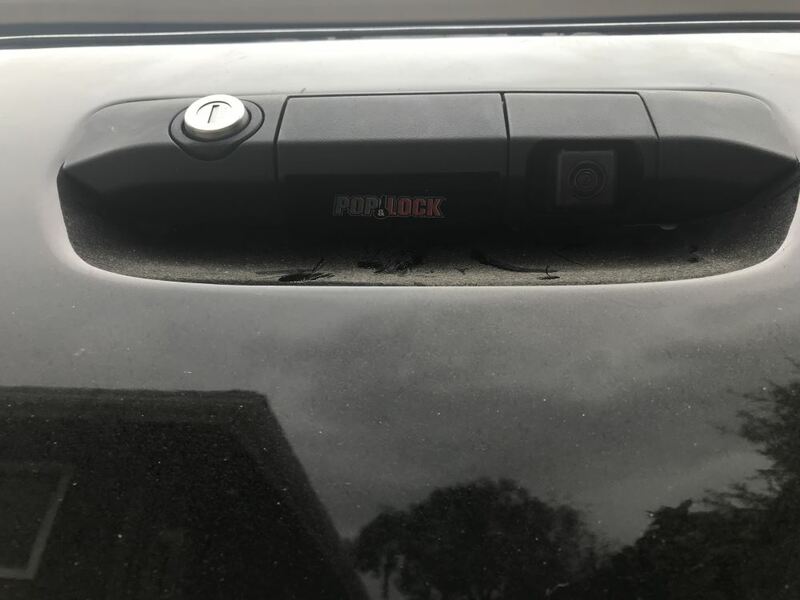 The folks at Pop and Lock tell me that the # PAL5500 locking tailgate handle is indeed compatible with the OEM back up camera. 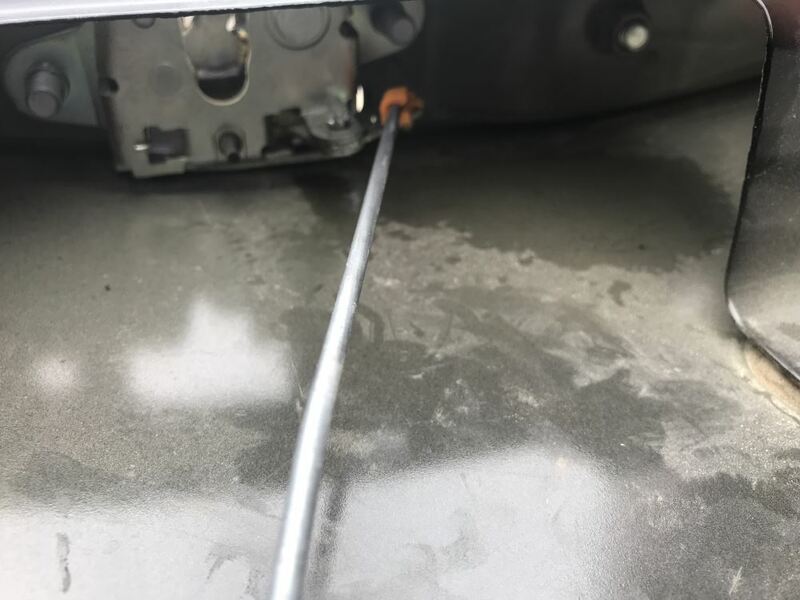 The camera would install in the slot in the back of the tailgate handle housing, and the small knock-out on the underside of the housing would need to be removed. I have edited a photo that shows where the camera would mount. The installation of the Pop & Lock is pretty simple. I've provided you with a copy of the instructions. You can look them over to see if this is something you'd feel comfortable trying for yourself. If you don't feel comfortable attempting the install yourself, any trusted mechanic should be able to complete the installation pretty quickly. For the 2013 Tacoma, you'd need the Pop & Lock # PAL5500. The locking tailgate handle is compatible with models equipped with the rear view camera system, and that installation of the locking handle will have no effect whatsoever on the operation of the camera. You might also be interested in part # PAL8525, which turn the tailgate lock into a power lock. You can see an install video for the tailgate lock by clicking the provided link.